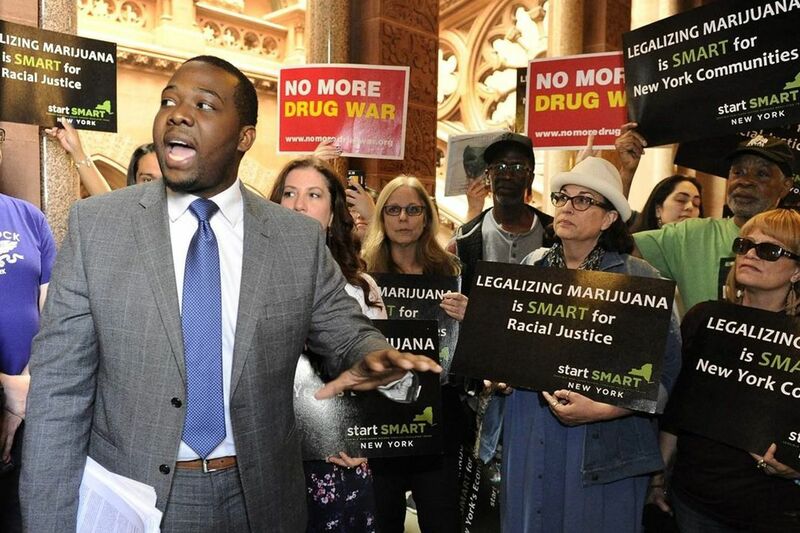 Chris Alexander, policy coordinator for the Drug Policy Alliance, advocates for marijuana legislation at the state Capitol in Albany, New York. Supporters say the bill would promote social justice and equity. Last week, U.S. Attorney for the Eastern District of Pennsylvania William McSwain filed a lawsuit against Safehouse, a Philadelphia-based nonprofit intent on opening the nation’s first overdose prevention site, commonly called a supervised injection site. In the news conference, McSwain challenged the large body of research that shows overdose prevention sites save lives without increasing crime or drug use. But whether overdose prevention sites save lives is not the crux of his case. That is curious, since the Justice Department has been looking the other way of another in-your-face illegal activity: state marijuana legalization. Both heroin and marijuana are classified by the Food and Drug Administration as Schedule I drugs — “no currently accepted medical use and a high potential for abuse" — so it’s hard to see how an overdose prevention site fits the definition of the crack-house statute yet a marijuana dispensary does not. And yet, 33 states have legalized medical marijuana and 10 states legalized recreational marijuana. McSwain noted in his remarks when announcing the lawsuit that Gov. Tom Wolf does not support overdose prevention sites. But recall that during Wolf’s first term, Pennsylvania legalized medical marijuana, and shortly after his reelection, he opened the door for recreational legalization. That’s a good thing. States began legalizing medical marijuana in the 1990s. Congress prohibited the Justice Department from standing in the way of medical marijuana. The logic is clear — sometimes the law is too slow to respond to the health needs of our society. In those instances, it is more problematic to enforce than to overlook. Things became more complicated in 2012, when both Colorado and Washington state legalized recreational marijuana, something McSwain might classify as in-your-face illegal activity. President Barack Obama’s Justice Department instructed federal prosecutors and law enforcement to look the other way on marijuana legalization, unless states do egregious things, such as selling marijuana to little kids. But in 2018, then-Attorney General Jeff “good people don’t smoke marijuana” Sessions threw the status quo out the window and said that marijuana prohibition is just like any other federal law. No anti-marijuana zealot federal prosecutor decided to shut down dispensaries since. But, if McSwain scores a victory against overdose prevention sites, other War on Drug prosecutors might find the courage to go after dispensaries — they will also be armed with precedent. So much for drug-use solidarity and a comprehensive critique of federal drug policy. Marijuana legalization has proven successful despite federal prohibition. States that have legalized medical marijuana have expanded choice for patients suffering from pain, nausea, epilepsy, PTSD, and gastrointestinal diseases. According to the Drug Policy Alliance, states that legalized recreational marijuana have seen a dramatic reduction of marijuana-related arrests, which disproportionately impact people of color, and have even seen a reduction in overdose deaths. If given the chance, overdose prevention sites will prove successful, too. And the people in addiction who are dying in Philadelphia at a rate of three people every day need them. They also need the support of a movement that managed to bypass federal law once before to achieve its goals. The fight for marijuana dispensaries and the fight for overdose prevention sites is the same fight — against prohibition, and for safer drug use for everyone.